Tres leches cake. 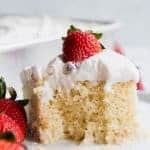 This easy to make tender cake is drenched in a three milk mixture, topped with fluffy whipped cream, and can be topped with a sprinkle of cinnamon or fresh fruit for a truly authentic Mexican dessert. In a medium size bowl combine the flour, baking powder and salt. Stir together with a fork. In a large bowl combine the egg yolks(separates the egg whites into another medium size bowl), with 3/4 cup of white sugar. Stir together until fluffy. Add in the vanilla extract. Stir to combine. Add the dry ingredients to the wet ingredients, stir to combine. Add in the milk. Stir to mix. Whisk the egg whites with a hand or stand mixer, once the egg whites start getting foamy and white in color add in the last 1/4 cup of sugar. Continue whisking or mixing on high speed until smooth, white, and stiff peaks form. Fold the egg whites into the cake batter. Grease a 9×13 cake pan. Pour the cake batter into the cake pan. Bake for about 30 minutes or until the top of the cake is golden and a toothpick inserted in the center of the cake comes out clean. In a large measuring cup combine the milks needed for the milk mixture. Whisk together. When the cake is cooled to room temperature. Poke all over the top with a fork. Then pour the milk mixture over the entire cake. Cover the cake and chill in the refrigerator for at least 4 hours to overnight. After the cake has chilled and soaked in the milks, prepare the whipped cream. Add the heavy cream to a large mixing bowl. Mix on medium speed until cream starts to thicken, then add in the powdered sugar and vanilla extract. Continue mixing on medium to high speed until soft peaks form. Spoon the whipped cream onto the cake, spread with a spatula or butter knife. Serve the cake with a sprinkle of cinnamon or fresh fruit if desired. Store the cake in the refrigerator for up to 4-5 days, best if eaten within 48 hours. Cook time does not include 4 hour chill time.